Is Mitt Romney about to flip flop on illegal immigration and the DREAM Act? The biggest problem that many conservatives have with Mitt Romney is the fact that he is a fake and a phony with no core or true political beliefs other than the fact he believes he deserves to be president. This has many conservatives worried that Mitt Romney will say or do whatever it takes to win the presidency and nobody can really be sure how he will govern if elected–after all, this is the man who once ran to the left of Ted Kennedy and if the political winds change at any time during his presidency it is likely he will be swept right up into them instead of standing firm against them. We got a little confirmation of our worries by a highly unlikely source in one of Mitt Romney’s top level campaign aides, Eric Fehrnstrom, who compared the Republican nominee to an Etch-A-Sketch which could be shaken up during the general campaign in order to give Romney a blank slate from which to work. Mitt Romney’s clarification did not help to clear things up, in my opinion, when he stated he was “running as a conservative.” He didn’t say he was a conservative, simply that he was running as one. A very interesting choice of words, don’t you think? So conservatives have been hoping that the Republican primary version of Mitt Romney was the real Mitt Romney–and have been hoping that Ann Coulter’s laughable assertion that Romney tricked Massachusetts liberals into voting for him was actually true–and have been holding their breath each time he speaks hoping that he will remain true to conservative values. Sadly we may have just gotten our first hint that Mitt Romney might be stringing the conservatives along after all. Aside from the economy and spending there is another issue which is not quite as important but is very important none the less, and it actually does tie into the economy and spending, and this is an issue which will have to be dealt with sooner rather than later. I am talking about illegal immigration and during the debates Mitt Romney took what was perhaps the most hardline stance against illegal immigration out of all the candidates. He promised us we could trust him to crack down on the ever-growing problem. That is a pretty cut and dried position; providing the children of illegal immigrants in-state tuition rates encourages people to enter the United States illegally to take advantage of our system, that is what Mitt Romney said and there is little wiggle room to back down without seeming like a flip flopper, but that might be exactly what Mitt Romney is now trying to accomplish. Republican Senator, and vice president candidate, Marco Rubio is in the process of creating his own version of the DREAM Act and it appears as if Mitt Romney might be softening his hardline stance against it. Romney has stated there are quite a few good points in it, but stated he was still studying it, while Kansas Secretary of State Kris Kobach states that if Rubio’s plan contains any time of amnesty he expects Mitt Romney to hold firm in his opposition to such legislation. Mitt Romney opposed the DREAM Act when it was passed by a Republican opponent–Rick Perry–yet is now claiming he is open to the DREAM Act when another Republican–Marco Rubio–is proposing it even though there may actually be a form of amnesty included in the bill. Two different Republicans with two similar versions of the DREAM Act, so why is Mitt Romney not dismissing it out of hand? The answer could be twofold: first, Marco Rubio happens to be Hispanic and there is the possibility that Mitt Romney doesn’t want to alienate either Rubio or his constituents, and second; we are technically now in the general election and the Etch-A-Sketch has been shaken. 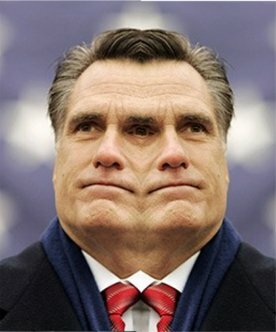 Neither scenario is comforting because if the former is the truth it shows us that Mitt Romney will end up caving on certain issues for fear of losing votes, and if the latter is true we must now pay close attention to which Mitt Romney emerges from the blank slate he is in the process of creating. Mitt Romney made no mention of opposing the bill if it contained a form of amnesty, which would have been an easy statement to make if he still held this position, and while we don’t know exactly what is in Rubio’s bill at this point both the bill and Mitt Romney’s reaction to it bears watching closely, because it looks as if Mitt Romney is once again playing both sides of the fence. Will the REAL Mitt Romney … Please Stand UP !! I have to admit, that was pretty funny. A vote for either is a vote for the loss of the US or A as you once knew it..
That video really sums it all up, they are just different sides of the same coin. Can you say ‘groomed’ for Obama’s place if Obama should lose? Yes Romney has been groomed by the media because they feel he would be the less offensive Republican in the even Obama loses, but they will turn on him once the general election is underway. The same thing happened with McCain in 2008 and you would think that America would have caught onto this plan and wouldn’t fall for this media trap, but we did. It is just too bad we fell for it again, isn’t it? Romney better worry about holding his base togrther instead of worrying about illegal immigrants. I’m not voting for a Democrat even if he has an “R” after his name. I’m with you there Jim! I’m in the anybody but Hussein in office camp. Romney while a luke warm little c conservative is still the ONLY choice we have…hell I would vote for Ford over the current Commander in dishevelment. I probably will fall in line and vote for ROmney, but at this point I haven’t made up my mind because I don’t think there really is much of a difference between the two. I’d vote for him if I could..eventhough there’s fraud in the polls.. he’s got waaaaay more support than the other two clowns. Ron Paul has quite a bit of support on the internet but it doesn’t quite show at the polls. Paul has a loyal following but it isn’t quite as large as his supporters believe it is. Vote for Ron Paul? Wait, lemme check on something…. We really don’t know who ROmney is, do we? He is just as bad a nominee as was John McCain and I fear the GOP threw away any chance they had at defeating Obama. So you are all saying four more years of Obama is ok with you? We are on the brink of disaster and this idiot is leading the charge. I have said before that it is not as much about the man as about who he surrounds himself with. Obama and his marxists, keneysian theorists and chicago democrats will destroy this country given 4 more years. He must go! No, four more years of Obama is not okay with me. But four years of ROmney isn’t going to be much better because the truth is that nobody we elect is going to do what is needed to save this country, we have already lost and the only question is, who is going to pick up the pieces.